If we know how an image was blurred, we can deblur it. 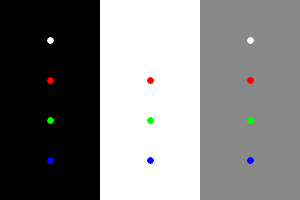 A point spread function (PSF) defines how a point of light is spread across an image. If we know the PSF that formed an image, we can derive the image as it was (more or less) before the light was spread by the PSF. For example, if a photograph suffers from camera-shake, and we know the exact nature of the motion, we can restore the photograph as if the camera hadn't moved. The technique shown here is the Richardson-Lucy deconvolution. For some aspects of photographic blur, including the concept of PSFs, see my Camera blurs. The script needs the PSF (or "convolution kernel") in the form of an image. The script then converts that to text, because ImageMagick currently requires kernels to be specified as text. This conversion, from image to text, is performed by my process module img2knl (see blah). The script needs IM to be compiled with HDRI (I think: check! blah). It does not need FFTW. I took a photograph of the night sky with a Nikon D800 camera, Noct-Nikkor 58mm f/1.2 lens, ISO 6400, at f/1.2, 1/10 second, hand-held. The sky was not entirely dark. Show the image resized, and a crop. Pick a bright star (or maybe it is a planet), and process it to make a kernel. Deconvolve the photo with this kernel. Bayesian-Based Iterative Method of Image Restoration, Richardson, 1972. Wikipedia: Richardson-Lucy deconvolution, retrieved 10-November-2014. rem %2 is kernel (PSF). rem %3 is number of iterations (default 10). rem %4 is optional name of output file. @rem We need option to NOT convert to linear. Source file for this web page is camblur.h1. To re-create this web page, run "procH1 camblur".